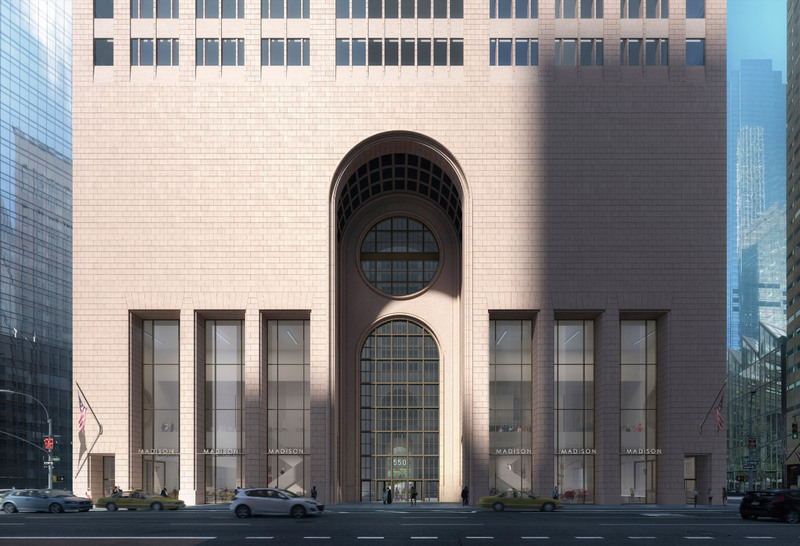 Snøhetta has released a swath of renderings showing how the studio plans to update the base of Philip Johnson’s (now landmarked) 550 Madison Avenue ahead of a December 4th Community Board 5 (CB5) Landmarks Committee meeting. After taking flak over their initial plans to peel back the granite facade from the postmodern tower’s base and replace it with glass, Snøhetta has released an alternate vision that will instead infill the building’s colonnade with retail. The biggest change would be to the rear passage that runs between East 56th Street and East 55th Street. Gwathmey Siegel Kaufman fully enclosed the lot within an arched glass-and-steel canopy during a renovation in 1994, and retail was installed inside: Snøhetta would replace the structure with a slimmer, open-ended alternative, scrap the retail, and instead turn the space into a massive garden. 550 Madison, originally built to headquarter AT&T in 1984, became the youngest landmarked building in New York City this past July, but owing to a secret demolition suffered in January, the lobby became ineligible for landmarking. Previously, four elevators at the back wall of the lobby would take employees and guests up to the office tower’s sky lounge 65 feet up, and traffic would be routed from there. Under Snøhetta’s scheme, the two elevator bays will be rotated 90 degrees, one to the north, one to the south, creating a passage through to the rear garden. The rear wall will only be gaining a window; a separate side door will be used to access the garden through the lobby. The Madison Avenue–facing loggias, originally public arcades that were enclosed in 2002 when Sony owned the building, would also be getting an overhaul. In the current scheme, the gridded windows would instead be replaced with a system that uses 12-foot-tall panes. At the rear, Snøhetta has designed a glass awning supported by Y-shaped steel columns that would open to the street at either end. Gwathmey Siegel Kaufman had covered one of the rear yard’s windows with a steel plate so an HVAC system could be run through, but that window would be restored if Snøhetta’s scheme is approved. In their renderings, Snøhetta has proposed a waterfall and public garden—the area currently only holds a few planters. Overall, Snøhetta claims that its updated plan would only touch six percent of the building’s facade and would increase the amount of public space from 14,600 square feet to 21,000 square feet. Plans to renovate the tower’s interior are ongoing. Although the building was originally designed to house 800 office workers, developers Chelsfield America and Olayan America, along with minority partner RXR Realty, are still on track to convert the building into Class A office space for up to 3,000 workers. AN will follow this story as it develops and will update this article following the CB5 meeting. It’s official: Philip Johnson and John Burgee’s postmodern Manhattan skyscraper 550 Madison, better known as the AT&T Building, is now a protected landmark. The Landmarks Preservation Commission (LPC) voted unanimously this morning to landmark the 1984 tower, making it the youngest building to receive landmark status in New York. A movement to protect the building began last year when developers Chelsfield America and Olayan America revealed plans to renovate the base of the tower. The contested (and protested) scheme from Snøhetta to strip the pink granite from the 110-foot-tall arch and loggias at the tower’s base and wrap it in glass drew immediate criticism when revealed in October 2017. The proposal would have unbalanced the tripartite arrangement between oversized openings at the base, in the central tower, and through the ornamental “Chippendale” topper, and preservationists and Johnson’s contemporaries rallied to prevent alterations. Before designating the AT&T Building as a landmark, commissioners noted the outpouring of support from residents, critics, and architects at the public hearing on June 19. Special attention was drawn to the building’s relatively recent completion date; Fred Bland, the interim chair of the commission, remarked that it was one of the rare buildings of which commissioners had experienced the original intent. To that end, commissioner Kim Vauss recounted that on a tour of the building in college she was struck by the grandeur of the original lobby. It was only years later that she would learn the original lobby was gone, AT&T’s Golden Boy statue having been removed by Sony in 1992, and the arcades having been converted into enclosed retail spaces in 2002. Keeping retail off of Madison Avenue and confined to the passage between East 56th Street and East 55th Street (now enclosed by a Gwathmey Siegel Kaufman-designed canopy added in 1994) was Johnson’s original intent, something that Sony disregarded during their occupation. The lobby was ineligible for landmarking as the ownership consortium–including minority partner RXR Realty­­­­–demolished the ground floor interior in February. The demolition is part of ownership’s plan to reorient the building by creating a large enclosed garden and seating area in the rear and to open up sightlines through the new lobby. The tower’s interiors, originally designed for 800 single-tenant employees, will be converted into Class A office space for up to 3,000 workers. 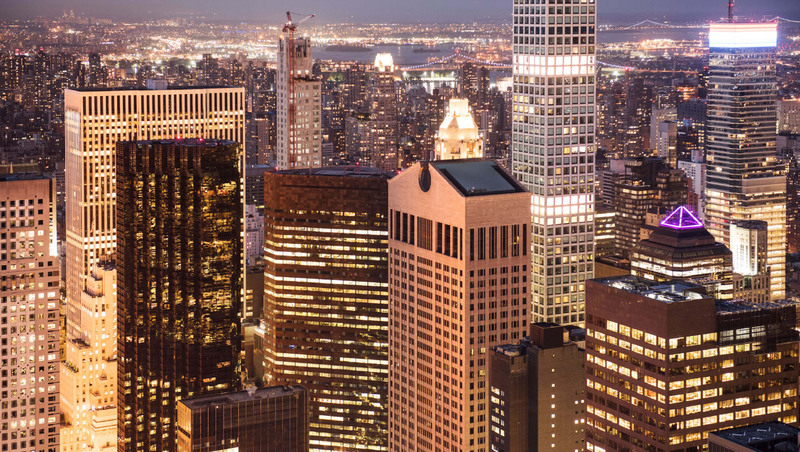 550 Madison’s ownership team released the following statement to AN: “We are proud that 550 Madison is now an official New York City landmark, claiming its place in our city’s architectural heritage. Ownership strongly supports designation of the iconic office tower and applauds the Landmarks Preservation Commission’s decision. Since acquiring the building, we have taken our role as stewards of this important building very seriously. We look forward to an ongoing dialogue with the LPC and other stakeholders to preserve 550 Madison's legacy as a commercial Class A destination in East Midtown, with smart and sensitive modifications to serve modern tenants.” When reached for comment on what exactly the designation covers, the LPC issued the following statement: "The landmark site for the AT&T Corporate Headquarters Building is the tax block and lot (Tax Map Block 1291, Lot 10), and includes the exterior facades of the office tower and the annex, and the exterior facades of the enclosed covered passageway." 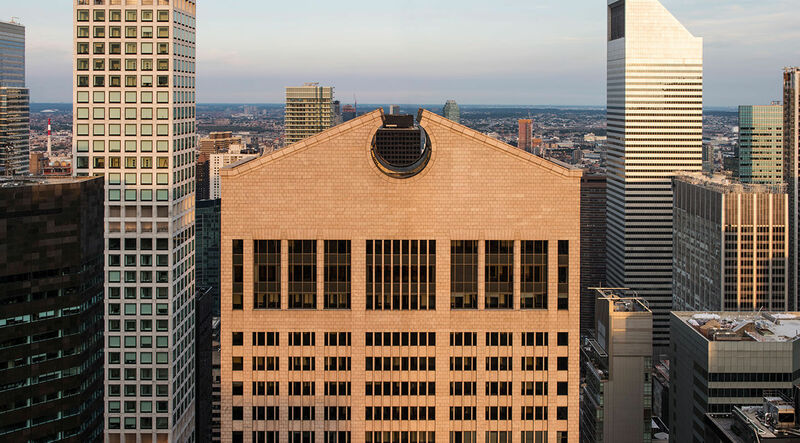 The winding saga of Philip Johnson and John Burgee’s hulking 550 Madison took another turn yesterday, as New York City’s Landmarks Preservation Commission (LPC) considered landmarking the postmodern office tower’s granite exterior. Preservationists, architects, and colleagues of Johnson’s took the stand to deliver public testimony in favor of the potential landmarking, and even ownership spoke on how they would sensitively redevelop the building with input from the commission. The furor over the former AT&T headquarters began with the initial reveal of Snøhetta’s plan to glass over and encase the base of the tower in October 2017, demolishing the great archways and loggias that, at the time of the building’s opening in 1984, formed a looping privately-owned public space (POPS). The original plan would have stripped the base’s defining 110-foot-tall granite archway and redefined the balance between what had been designed as a tripartite structure (the looming base, the center wall of windows, and the ornamental “Chippendale” topper). The LPC moved quickly to calendar the building in November of last year but also noted that, due to development partners Chelsfield America and Olayan America’s decision to demolish the lobby (against the wishes of Community Board 5), only the exterior would be under consideration. 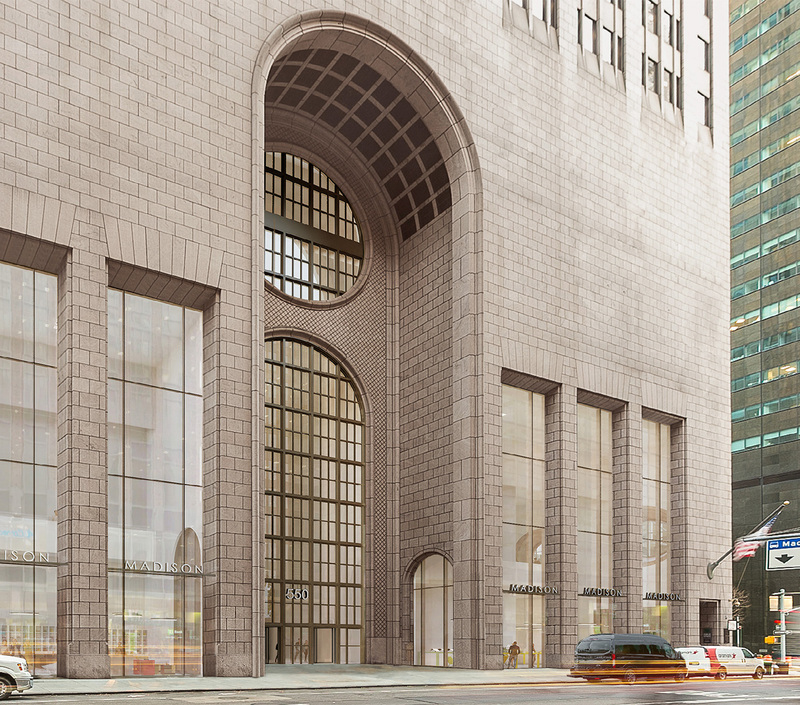 At the most recent meeting of the Landmarks Committee, Seth Pinsky, executive vice president of RXR Realty­­­­—now a minority partner on 550 Madison’s redevelopment—spoke on behalf of the building’s owners and discussed the new scheme they would be presenting. Snøhetta’s glass curtain wall is out, and ownership now officially supports landmarking the tower’s exterior. As a result, they would also like to remove the building’s rear annex and renovate the arcade covered by Gwathmey Siegel Kaufman during their 1993 renovation for Sony and bring the rear yard condition closer to Johnson and Burgee’s original vision. This would create a much larger enclosed garden and seating area. As for the tower’s interiors, originally designed for single-tenant occupancy and for a maximum of 800 employees, Pinsky stated that the current plan was to build out Class A office space for up to 3,000 potential workers. The vast majority of testimony read at the hearing was in favor of landmarking the former AT&T Building. Some in attendance spoke on the building’s noble intentions but purported failure to connect with the street level; in Richard Rogers’ statement, delivered via surrogate, it was noted that while the tower itself has always been impressive, the successive series of interventions at the ground level have only strayed further from Johnson and Burgee’s original intention. The committee received an additional 12 letters of support for landmark status, including from the National Register of Historic Places. Ultimately, the fate of 550 Madison will likely be determined at an unspecified later date wherein commissioners will take Tuesday's testimony into account. The building's owners will continue to tweak their proposed scheme in the meantime. AN will continue to provide updates as they become available. After a nearly five-year delay, a $350 million mixed-use development in Jersey City is slated to break ground in the next few months. The Real Deal reports that the Jersey City Municipal Council and Planning Board approved plans back in December. 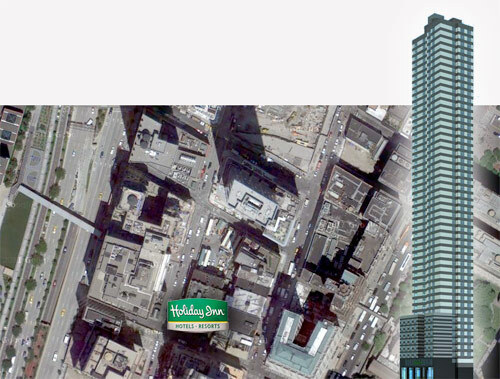 Gwathmey Siegel Kaufman + Associates Architects will design the two 50-story towers at 70 and 90 Columbus Street. The 1.2 million-square-foot development, a joint venture by Ironstate Development and Panepinto Properties, will consist of a 150-room hotel and approximately 1,000 rental apartments in addition to retail space. 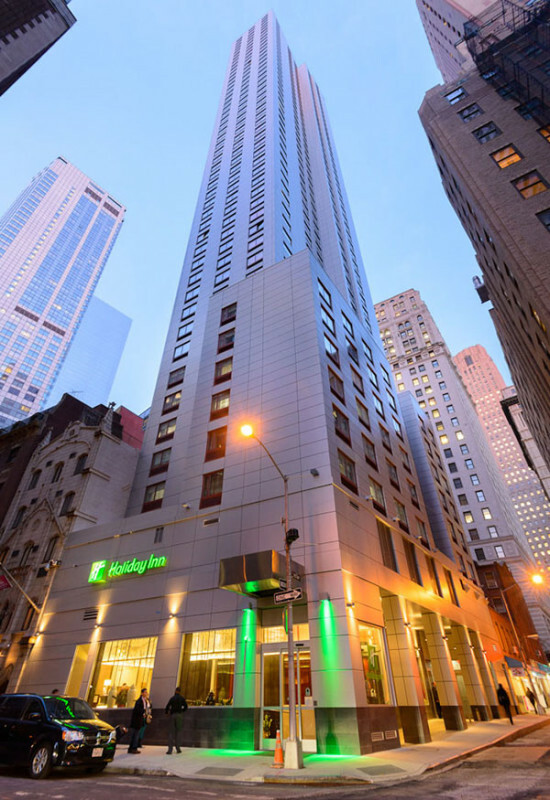 We heard rumblings, but now it’s official—a 400-room, 50-story high Holiday Inn will be joining the ranks of downtown hotels at 99 Washington Street near the World Trade Center. It will be the world’s tallest Holiday Inn and the go-to architect for New York hotels, Gene Kaufman of Gwathmey Siegel Kaufman & Associates Architects, will be doing the honors. Kaufman’s other high-profile hotel projects, the Chelsea Hotel renovation and the new Hyatt near Union Square, seem to be moving full steam ahead, despite legal wrangling at the Chelsea. The Holiday Inn will likely open to guests by the end of this year.